A while back I was awarded a grant from the Arts Council’s Artists’ International Development Fund to support a trip to Japan, largely to nurture seeds sown when I was out there last year with Watershed’s Playable City programme and doing my own things. As with all good projects, since then the title of my proposal – Tokyo Interactions – has become hopelessly inaccurate as ambitions creep and good things get linked together. 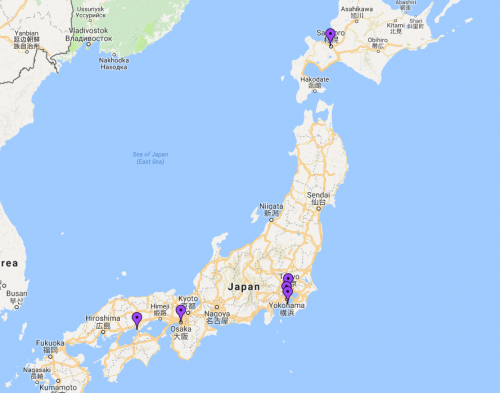 I’ve just booked the final piece of my accommodation jigsaw puzzle, so hopefully all the major details are now stabilised and my trip will range from Kurashiki-shi in the West, up to Sapporo in the North. About 720 miles as the crow flies …which of course I won’t be doing. The woman at the travel agents laughed when I enquired about the feasibility of doing Sapporo to Kurashiki-shi in one day by train. She reckoned that, even with the magnificent shinkansen, I’d be regretting my decision by about half way through. So, out with the rail pass and in with the domestic flights and night busses. The main purpose of my trip is to work with artist Megumi Ishibashi. In December we were musing on what would happen if we combined some of the interactivity of my practice with the sculpture of her practice. Well, the plan is to find out. I also have research questions around what sort of an ecosystem is out there that could support my practice in general. Most of the art I’ve encountered so far has been very much based in the system of commercial galleries, although I’m aware of a few friends – Megumi included – who have taken part in outdoor sculpture festivals. To this end I’ll also be visiting a lot of different fabrication spaces, figuring out where to buy kit, and also scoping the streets looking for opportunities to do interesting things where people aren’t necessarily expecting it. I’m looking forward to meeting up with the Playable City Tokyo crew too, as it’ll be really interesting to find out how/if last year’s workshop has infiltrated the way they do things. I’ll also be visiting a few festivals. 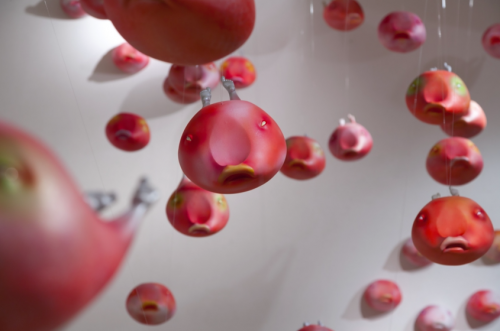 Sapporo International Festival is this year asking questions around critical mass with its themes of “How do we define ‘Art Festival’?” and “When Bits and Pieces Become Asterisms”. Yokohama Triennale’s theme of “Islands, Constellations and Galapagos” is similarly a way in for conversations about isolation and connectivity, whilst Koganecho Bazaar starts with “Double Façade: Multiple Ways to Encounter the Other” to express an encounter between art and local community. I’ll also spend a few days in Setouchi Triennale territory, curious about what art lingers out of season and whether places like this might be more predisposed towards unusual encounters in the streets.